Proceed With Endorsement in Auto Insurance Policies - Learn The Know-How's! HomeCar InsuranceNewsHow To Request for A Car Insurance Endorsement? How To Request for A Car Insurance Endorsement? Learn About The Types of Vehicle Insurance Endorsements. Here’s the kicker – asking for an endorsement for your motor insurance online policy is no rocket science. It is much easier than you think. The policyholder kick-starts the process by submitting a letter of request to their insurer. Wondering what’s in the letter? Well, the policy-bearer requests the need for alterations in an existing policy. It is then in the hands of the insuring company to proceed with the changes. However, not every alteration you request for as a customer in your vehicle insurance policy will be processed right-away. The insurance company will first check the accuracy of these changes demanded and then give a green signal. Know about the Endorsement type in insurance! 1. Alteration requested for a change in engine number. 2. Change in the vehicle’s registration number. Quite a probability in case of a new vehicle. 3. In circumstances wherein there’s an alteration of the policyholder’s physical address. 4. Change in the chassis number of the vehicle. 5. In case the contact info of a vehicle is updated. This could include a change in the email ID or mobile number. 6. Endorsements related to a correction or change in your car’s variant. 7. In cases wherein the model or make of the car has been incorrectly written. 8. Many a times, your name could be spelled incorrectly. This does call for an endorsement. 9. If there’s a change required in the vehicle’s fuel type, endorsement can be issued. 10. If a policy includes addition or deletion of electrical accessories, endorsement could come in as a great help. 11. Including CNG or LPG kit in the vehicle can be listed as an endorsement type. 12. If the cubic capacity of the vehicle has been typed in incorrectly, endorsing the same would help. 13. The count of passengers covered or the seating capacity in your vehicle require alterations. 14. 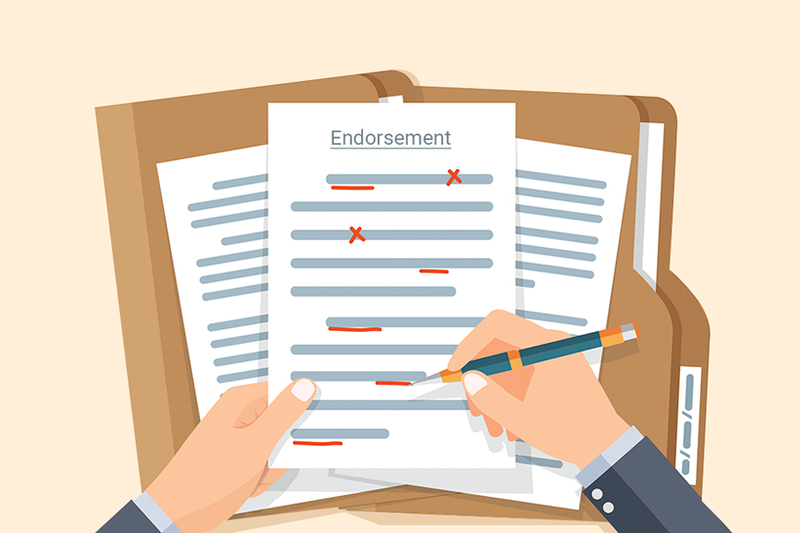 If any correction was made in the No Claim Bonus, it can be subjected to endorsement. 15. If changes in the details of the nominee are to be processed, endorsement is the way to go about it. 16. If edits need to be made in the vehicle’s year of manufacturing. 17. When the ownership of a vehicle is transferred, the new details of the vehicle must be updated via endorsement. Bear in mind, best car insurance endorsement might sound like a piece of pie, but the requisites are pretty clear. So, if auto insurance has been a priority ever since you’ve purchased your vehicle, ensuring that the facts updated are 100% correct without a miss is mandatory. If otherwise, endorsements come in handy. You must submit the complete set of documents. - Proof of changes requested to be endorsed.